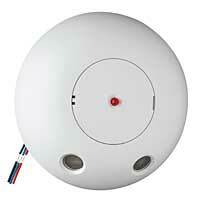 A line of sensors and timers to reduce lighting energy consumption is available from Legrand. Options range from toggle-style to decorator models, with commercial ceiling- and wall-mount sensors available. Commercial sensors include passive infrared and ultrasonic versions, with adjustable time delay and up to 2,200 square feet of coverage on some models. Power Pack and Add-A-Relay accessories are also available.